At this point, I had made a decision as to what powerplant to use in the full sized boat. As you are probably aware, locating a Ford V8-60 in this day and age is fairly close to impossible and as a second thought, who, in their right mind, would install an outdated, VERY hard to get parts for, engine in a new boat? The range of available powerplants is really very wide. I contemplated using a water-cooled Kawasaki 900cc motorcycle engine (which I have) or possibly a late 80's Buick 3.8 V6. While discussing the options with my cousin (a well-known engine builder in the Drag racing world) he suggested the 1961-63 Olds/Buick 215 cubic inch Aluminum V8's, because of their low weight factor, 290 lbs., ready to run (w/o exhaust manifolds), adequate horsepower and reliability. The Kawasaki was rejected because all marine related equipment would have to be fabricated and the engine was pretty tall, necessitating tilting of the engine. Neither was a real problem, but it gave me an out. Next, the Buick V6 was rejected partly because of the weight... about 450 lbs. And the engine, even with the low fuel injection was still in excess of 27" tall. The thought of a V8 in the Tiny Might really appealed to me because of my previous background in hot rodding. I was able to locate and obtain two engines in my immediate area. My cousin's neighbor just happened to have a '63 Olds Aluminum engine that he was going to put into a Vega (project started many years ago) and when contacted, gave me the engine, complete. I also found a Buick version of the engine that one of my co-workers had planned to install in a kit plane. This motor was obtained for a very modest sum. I made a 1/8th scale model of the Olds motor and guess what... It's going to work! After building the engine model and mounts, I got a little carried away and decided to really finish the model. The hatch cover was modified to provide clearance for the 4 brl carb and spark arrestor. The hull was stained and sealed inside to enhance the looks of the mahogany. The exterior was prepped and primed with a couple of coats of Polane (great S/W product) and finished with three coats of PPG Corvette Competition Yellow polyurethane enamel. Oh yeah... prior to the final finish, the forward deck, cowl and deck area behind the seat were covered with carbon fiber, to give it a high tech look. I also fabricated the shaft (1/8" brass brazing rod) shaft log, strut, prop, rudder, steering wheel, gas tank, battery and holder and the foot pedals for the throttle and adjustable cavitation plate. 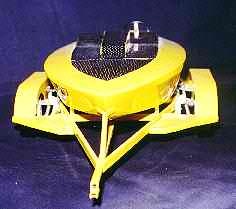 When I finished the model, I had nothing to put it on so I built a tandem, independently suspended trailer to the same scale. The trailer was constructed from rectangular brass tubing and sheet. The suspension components were machined from aluminum and the wheels are actually mahogany (painted). Enclosed you will find a couple of pictures of the boat model and trailer, along with pics of the frame/suspension/engine/trans for my tow vehicle, which is an '87 Dodge mini ram van (no windows) with Corvette suspension, LT1 V8/Auto trans. As you can see, I haven't finished the body shell, but it will be painted the same bright yellow with a carbon fiber insert on the hood. I apologize for the caliber of the photos, but I only have an old 35mm w/fixed lens. I am currently assembling the transom and frames for the full size boat. I have the Stem, Breasthook and motor stringers laminated and ready for final finish/trimming. I was delayed for a while due to the variation in thickness of the material for the frames, etc. The mahogany was hand picked and I was more concerned with grain consistency and material soundness. I thought I had all the tools required, but found out that a planer, or access to one is a must to insure good, solid construction. I know, when I first registered my plans and intentions on your Project Registry, you E-Mailed me advising of too much horsepower. There is no such thing! In the 1930's, Gar Wood put FOUR (4) Liberty engines in a 38' boat with a 12' beam. That's minimum of 4000 lbs with about 6000+ hp. 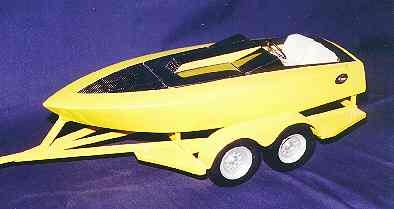 I really don't think that installing the Aluminum V8 in the Tiny Might will upset the handling of the boat... up to 50 mph. This, I think the design will handle with no problem. I am quite aware of how a small boat handles as speed increases... they turn into slippery pumpkinseeds. I plan on constructing the Tiny Might (renamed TOO MUCH, thanks to you) like a fine piece of furniture and want the finished product to be unique and at lease as nice as the model. As I progress through the construction process, I'm sure I will require your assistance and expertise at times, and hope I will be able to count on you. Thank you for letting me ramble on.